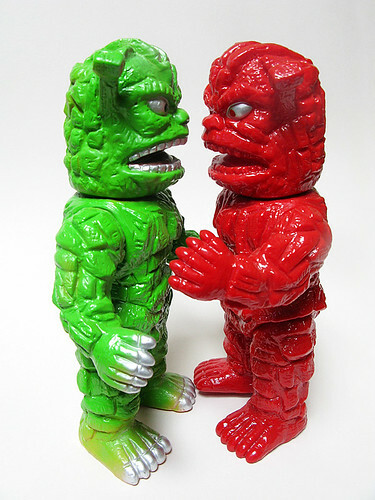 Discussion in 'Japan Toys' started by kurumonz, Aug 27, 2010. Thought it's better to consolidate all Spectreman stuff here. Just noticed that Zinc's version of the Dustman is a different version than mine. Anyone care to shed some light into this? His is painted over flesh vinyl with silver highlights but mine is oon green vinyl with gold highlights on torso and silver on toes and fingers. I see some slight differences between yours and mine. The pupils are painted larger on yours. The red in the mouth is also brighter. But yours is green vinyl? Here's a shot of the feet with the foot stamp. Well the stamps are the same so that's good news. Hopefully someone out there be able to enlighten us of why the differences. I don't see why the stamps would have been different to begin with... they're the same figure, just two different paint versions. I may be wrong, but I think the light green on flesh vinyl is the CCP version. The green vinyl with gold and silver paint is the Masudaya version. I just got the green with silver and gold spray today. Surprised to see this thread. And interesting that the foot stamp on mine is different than the one pictured. Maybe one of our resident experts can shed some light? Melek- I think yours a vintage, with the extra copyright on the feet. Could you measure the height on yours? Height on mine is 8.5"
I thought the repros were done when CCP took over Mausdaya? Or was it a collab? The additional text on the stamp is "copyright Fuji Television." CCP reissued the Masudaya Spectreman vinyls. I am not aware that CCP took over Masudaya. There are many versions of each sculpt out there. I've never seen the green over flesh version before. I suspect both zinc and kurumonz's Dustman is the reissue version. CCP probably blocked out the Fuji Television mark since they were just reproducing the toy itself and likely did not deal with Fuji TV (whether this is typical licensing practice in Japan or not, I don't know). I thought it was vintage when I bought it. I have seen the same copyright on vintage headers. Mine is almost exactly 9 inches (8 and 7/ . I didn't know CCP made a dark green repro though. I thought it was just the red, light green and blue. akum6n- Thanks for the cool link. That looks like him. Just with better paint. 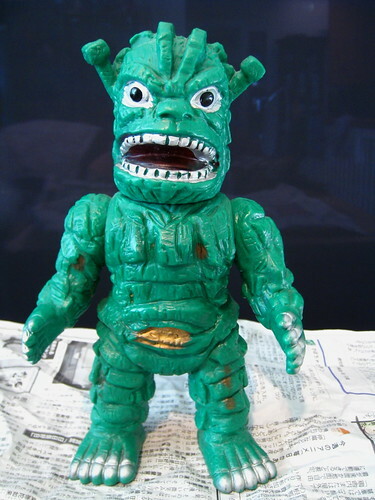 I've seen the vintage green Dustman at Mandarake Akihabara. That particular one had some typical surface wear and a less exact paint job, especially inside the mouth. It also didn't have much of a sheen, unlike the newer ones. But most of all it had a very strong "old toy whiff." Yes, I smelled it and it was definitely musty. And then put it back, deciding to not to start a new and even more dangerous habit of collecting vintage toys. Another question regarding the Dustmonster--I have this version, scored from a fellow boardie. It has yellow eyes, as compared to silver from the ones that I've seen, anyone? Interesting all green CCP version. I did not know it existed. Mine is green over flesh vinyl too. I find it better that way. CCP works with the original molds, except for Mitsukubi which has been lost. Melek's version is indeed a vintage. The footstamp is the proof. Your version puzzles me Jay, I've seen it when it was proposed for sale, and I found it strange as I've never seen it with yellow eyes. i don't have the slightest idea..he looks awesome though, I almost felt the eyes should've been painted yellow in the first place. Oh well, looking forward to score his brothers. The yellow eyes definitely look good on your blue version Jay. I hope to score some of the CCP versions (especially that blue) one day. The blue pops up on YJA every now and then. I think there's one other color they did for that beyond the blue and green. There's also the modern CCP sculpt, which freakin' kills. please stop teasing all of us unfortunate folk with that photo yet again! this is an interesting topic as i never really paid attention. there is another variation of the green version, so that makes three versions at least. it is painted on red vinyl and has yellow eyes. the blue also has at least two variations. one with the yellow eye and the other is silver eye. i wonder how many more? Right on. Great info maxaltoman. Way more versions than I had thought. At long last, my Spectreman grail! @plasticXO- never know when one will pop up. I waited years.